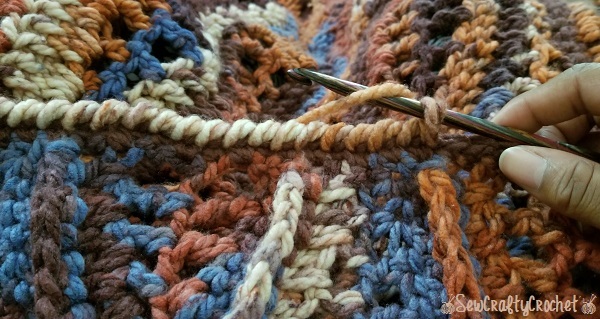 Do you ever try the patterns that are on the wrappers of skeins of yarn? I usually don't, but when I purchased a few skeins of Loops & Threads Charisma , I really liked one of the patterns. 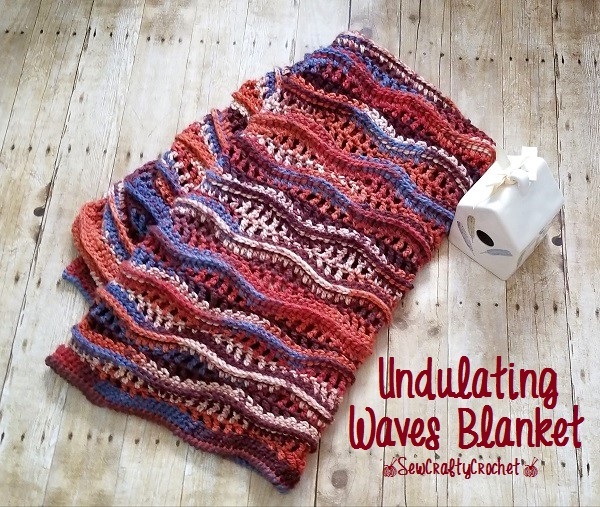 It's the Undulating Waves Blanket pattern. 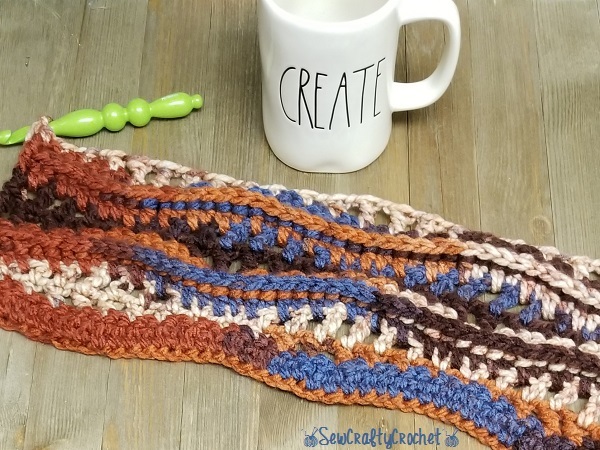 The pattern says to use 3 different colors of yarn, but I thought it would work just as well with a variegated yarn, so I used Loops & Threads Charisma Mountain Majesty . 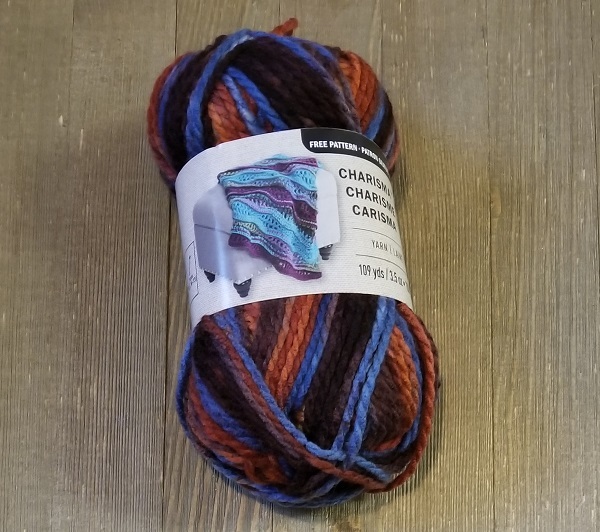 This is a skein of the Mountain Majesty yarn with a picture of the Undulating Waves Blanket. 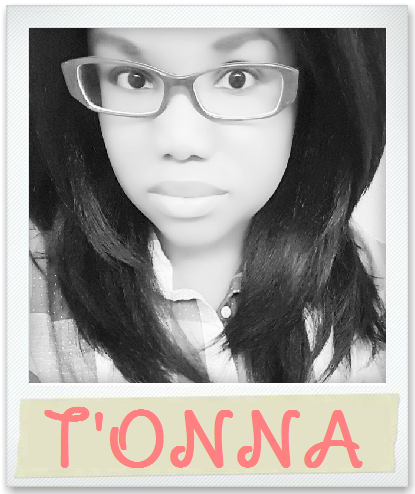 For this project, I crocheted with a size N/9mm crochet hook . With this pattern, you have to pay attention. I often crochet while watching TV, and I messed up a couple rows and had to frog it! 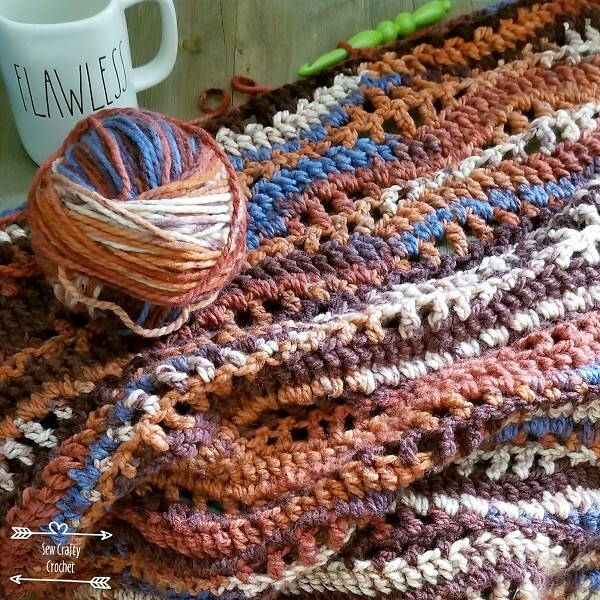 I hate frogging, but I want my projects to be as close to flawless as possible. So pay attention with this pattern! 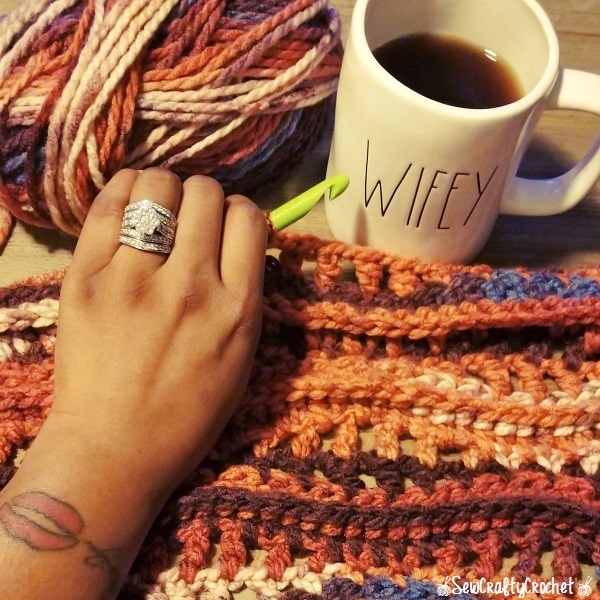 I enjoy crocheting for my loved ones, so once I finished this blanket, I gave it to my husband to keep him warm while he's away for work. I just love these waves! 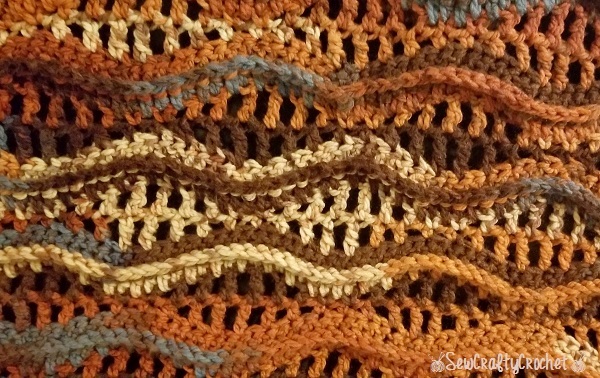 When I finished the blanket, I added a reverse double crochet border. 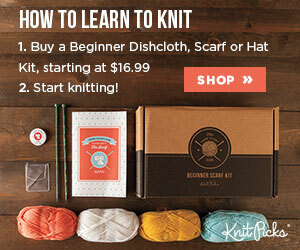 There are several great videos on YouTube that show how to do this stitch. One the crocheting was all done, the blanket needed some blocking to make it more even. When I block my projects, I use knit blocking mats and Knitter's Pride Knit Blockers . 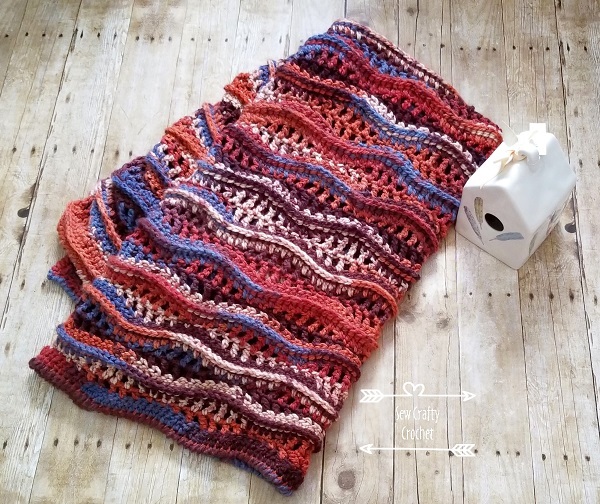 I enjoyed making this blanket so much that I've always bought yarn to make another for myself! I love these colors and the Loops & Threads Charisma yarn is fun to work with. This project worked up pretty fast also. What a fun fabric! 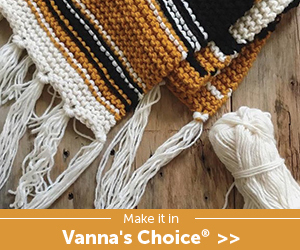 The variegated yarn worked out really well for this blanket, and the colors are perfect for a manly gift. I am sure he is going to enjoy it! I can't find a pattern similar to this and I really love it :( Did you by chance share it anywhere? The pattern is on the wrapper of the Loops and Thread yarn. 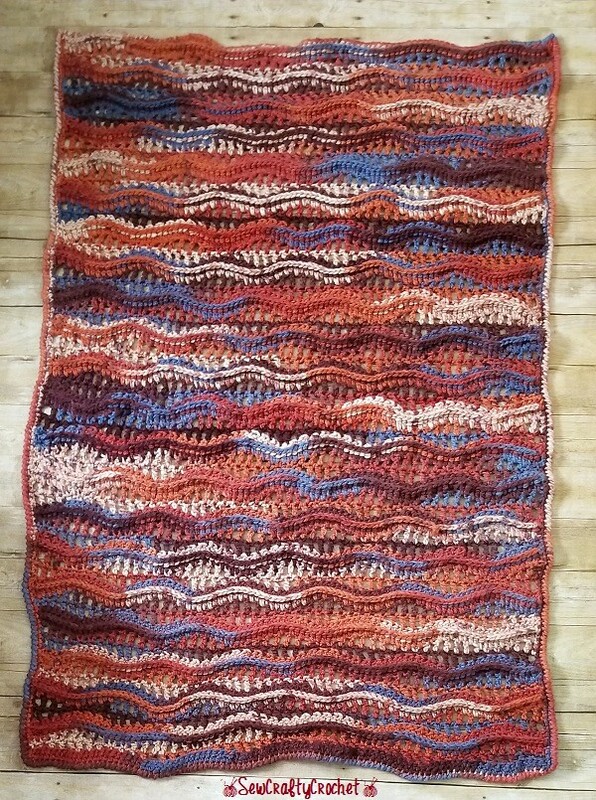 It's called the Undulating Waves Blanket. 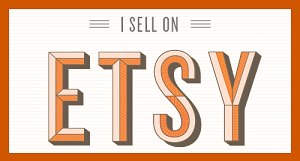 Hi—I purchased this yarn because I loved the blanket so much. I can’t figure out how long the beginning chain is. It just says (multiple of 16 + 5 for foundation chain). Can you tell me how to start it?